This classic German recipe is so simple, you can make Christmas cookies from scratch even if you're a terrible baker! I don't bake. I should say, I don't bake well. And waiting for each batch of cookies to come out of the oven is the worst! Most take about 10 minutes in there, right, so it's just enough time to stand around and be bored - if you go off to do anything, you'll forget the cookies and they'll burn. This is my stance on cookies, especially Christmas cookies, and I don't plan on changing it! However, there are some recipes, this one included, that are SO simple, so easy, and relatively fast (a sheet of these only take 7 mins to bake!) that sometimes, making cookies from scratch is worth it. My mom made these Spritz Christmas cookies every year growing up. They're simple and delicious. In fact, when I put the first one in my mouth (guys, DISCLAIMER! I actually gave the very first cookie to Henry because I figured if he'd eat it, there's no way it could be bad because the kid eats like six different foods total. Sound judgement in motherhood, right there.) I was instantly transported back to our 1950's ranch home in St. Louis Park, MN. I could taste the cold weather and the snow and the smell of the bright red down jacket I wore in elementary school. I remembered spending winter breaks playing American Girl Doll with my sister and sledding at Aquila Park, which was just two blocks from our home. It's funny how tastes and smells can bring you back to memories you cherish like a mystery time machine, isn't it? These Spritz Christmas cookies are as good as a effing mystery time machine y'all! Back to 2016. I'm now 32, married with two children and responsible for baking my own Christmas cookies. Not as much fun as when my mom or stepmom would do it, but such is life. I wanted to share with you an EASY recipe, since there's so much fuss around holiday entertaining. These cookies have 6 ingredients (from SCRATCH - none of that boxed nonsense. Ever pull up a pin on Pinterest for "3 ingredient cupcakes!" and it's all boxed and pre-made garbage? Dumb, there's more ingredients in that than you can list on all your toes and fingers). As long as you have a cookie press , you whip up the batter, fill the press, press them out, bake them for 7 short mins, and presto. You've rocked a Christmas cookie! Cream the butter and the sugar together. Slowly add the other ingredients. Fill your cookie press 1/2 full with the dough (should be nearly as stiff as pie crust, but not quite). 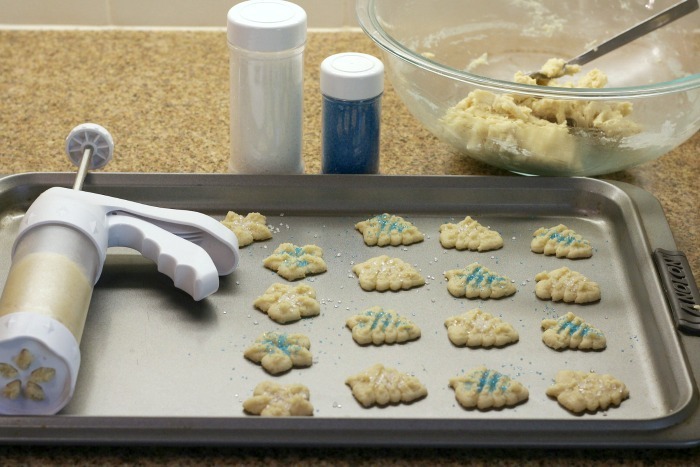 Select what designs you'd like the cookies in and attach that shape to your cookie press. 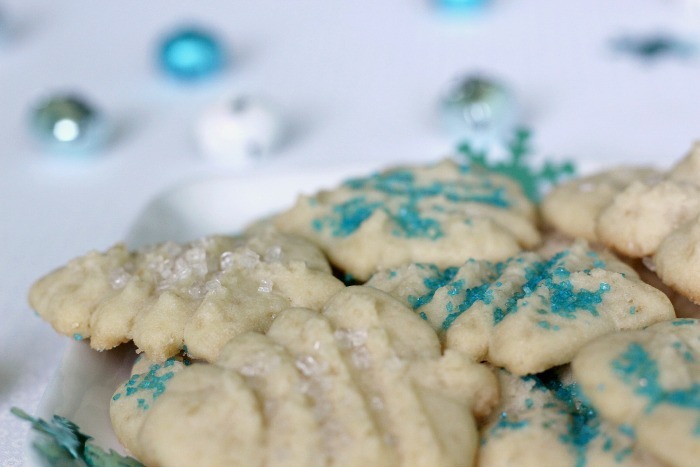 Press out a sheet of cookies and sprinkle with colored sugar crystals. Bake at 400 degrees for about 7 mins - until the dough is set but not yet brown. Let the cookie sheet cool before you press out another sheet. 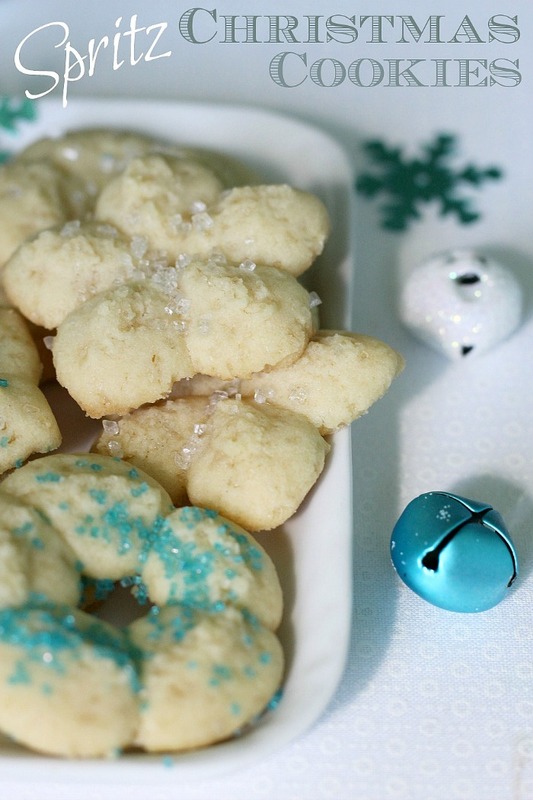 Enjoy this simple, buttery Spritz Christmas cookie! It's not overwhelmingly sweet, and since they're small, you don't need to feel guilty about enjoying one or two as a midnight snack. Merry Christmas! 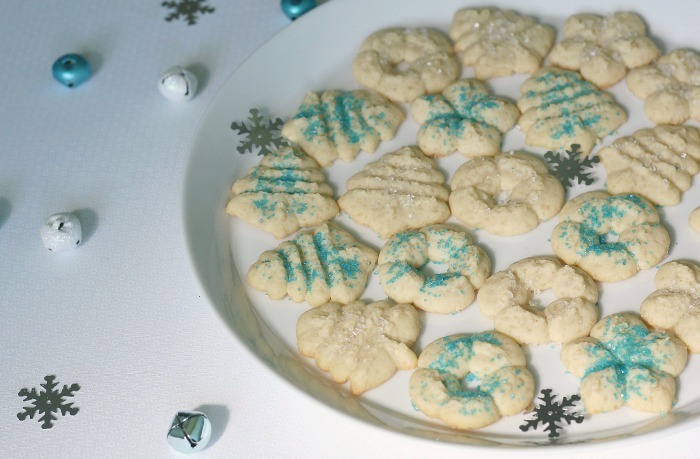 Pin this Spritz Christmas Cookie recipe to your Christmas or recipe boards! Out of all the things from my registry I didn't get a cookie press! Definitely need to grab one. I love how simple and real the ingredients are. Something about the holidays and familiar tastes/smells really does bring you back! hahahah I love that you had Henry eat the first cookie. 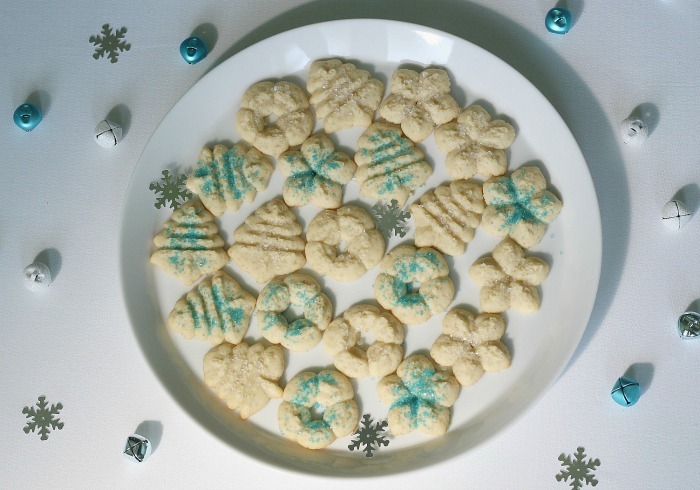 I have never made these but two of my best friends, who are sisters, make these cookies every year with their mom as a tradition - they bake hundreds of these and now I see how - they're so simple! How can you go wrong with butter, flour, and sugar? i am definitely a terrible baker so i am glad you started with that. i could probably make these though! they look yum. I love christmas cookies. I'm so excited to start making them. YUM!! I actually really enjoy baking cookies but have never made these. Gonna give it a shot! This looks dangerously easy. I love how you're already on the Christmas train when my Halloween hangover hasn't subsided yet. Need to make these for non-Christmas occasions too! This totally reminds me of growing up! My mom makes these every year - they're so good and fun to make. These look delicious Paige! 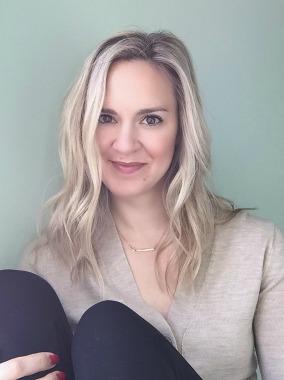 Is your mom of Scandinavian descent? My grandmother is German and Dutch and always made these growing up! I love that tool, I might have to get one of my own! I love spritz cookies! They are definitely an easy cookie to make. So funny you had Henry try the first cookie!! Don't you just love how recipes like this take you back? Food is so nostalgic to me. These look delicious - I'll have to whip up a batch this season. I love spritz! 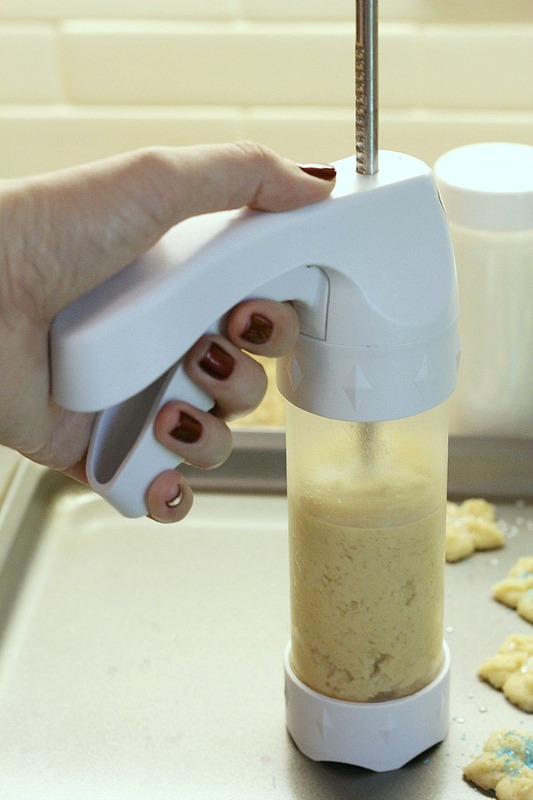 I've never used a cookie press though - I might have to try it this year!